Five Simple Tips for Harmonious Treehouse Building - Treehouse by DesignTreehouse by Design - So, you thinking about building a tree house? 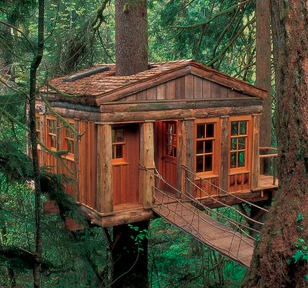 Needless to say, people who love treehouses love trees. But how to live harmoniously with nature without hurting it? This is one of humanity’s greatest challenges. Here are a few easy ideas that will help you build a longer-lasting structure that does the least amount of damage to the trees. 1.Say nope to the rope. Rope can do a lot of damage to the tree: it chafes away the bark with the movement of forces between the tree and the rope, and it chokes — and can even kill the tree over time. If you must use a tie-on material, use webbing. It has a wider surface area than rope, so it does less damage to the tree. 2. Bigger really is better. Use fewer larger bolts rather than many smaller ones. The idea here is that, unlike humans, trees don’t heal; they seal them and grow over injuries. A lot of smaller holes, especially in close proximity, risk causing the tree to die off the entire area. Not only does this damage the tree, it also weakens the anchors that are now set into dying and eventually dead material. The safest solution is to use a single large anchor rather than two or more smaller ones in close proximity (meaning within 2 feet of each other). Make sure your structure leaves space between your treehouse and the tree to allow air movement, which prevents tree infections and rot to your structure. This means building your structure on fixtures such as cantilevered bolts or brackets rather than directly against the tree. If you’re looking for such hardware, I found this little online catalogue. This building technique will also diminish the physical forces working against your structure, as the next tip explains. 4. What doesn’t bend breaks. If your structure is fixed and you anchor it to non-flexing points, you will definitely shorten your treehouse’s lifespan. Think of the way a tree sways in the wind. Now think about what that movement would do to a rigid structure attached to its limbs. Being former tree themselves, wooden beams can withstand some of that pressure, stretch and torque, but it comes at the price of longevity. Treehouses can last more than 20 years if built with savvy. Building them without adaptability to the tree’s natural movement can cut that lifespan in half or more. The earliest Buddhists must have lived in treehouses. The reality is that no matter how respectful you are, sinking bolts and erecting a fixed structure into a tree is going to cause some damage. Even the minimized damage of a few large, well-placed bolts yields decreasing benefits over time as the tree grows closer and closer to your structure, increasing the chance of disease and rot.